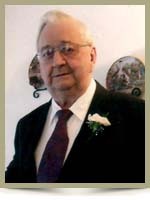 Frelick, Edwin Ross, 79, of Mersey Point, Queens County, passed away on Sunday, March 31st, 2013, in the Halifax Infirmary. Born in Mersey Point he was a son of the late John and Gladys (Hartlen) Frelick. Ed worked for the Bowater Mersey Paper Company, up until his retirement. He also owned and operated his own lobster fishing boat for many years. He enjoyed crossword puzzles and playing bingo. He is survived by his loving wife, Marie; daughters Nancy (Art) Sweeney, of Caledonia, Christine (Rodney) Knox, of Port Joli, Bonnie (Gordie) Wong, of Liverpool, Anne (John) Pineo, of Liverpool, Paula Frelick (Nathan Wamboldt), of Hunts Point; son John Frelick, of Liverpool; stepdaughters Vickie (Tim) Wolfe, of Brooklyn, Glenna (Jim) O’Brien, of Halifax; stepsons Tony (Kathy) Dagley, of Milton, Scott (Gwen) Oickle, of Western Head; grandchildren Douglas, Patricia, Marcia, Kim, Sarah, Shelia, Jimmy and numerous great grandchildren. He was predeceased by his first wife Gertrude; stepdaughter Barbara Anne; brother Arthur. So sorry to hear of Ed’s passing – he always had time for a chat when you met him. Thinking of you all. at our clinic. RIP my friend. Our sincere condolences to Marie and the Family.He will always be remembered for his laugh and stories.Take Care and all the best. To the family – Please accept our sincere condolences on the loss of your father. Dear Marie and family, so sorry for your loss, HUGS and remember I am just a phone call away. So very sorry to hear of your Dad’s passing…Cherish all of the memories you all had and hold them near and dear to your heart. Thinking of you all and sending our sincerest sympathy to everyone. Very sorry to hear of Ed’s passing. He had been very kind to my husband and friends taking them fishing when he still had his boat. to his family my very sincere condolences. Sorry to hear of Edwin’s passing. We have been neighbours for eight years now, and always enjoyed a friendly wave and greeting from Edwin daily. To his family, our deepest sympathy for your loss. Sorry to hear of his passing, Remember him most when he and his Dad handlining many years ago with my dad Curtis Huskins. Frelick family so sorry to hear of your loss ,be thinking of you in your sorrow……..
we would like to offer our condolences to Edwins family at this sad time for them. I am sure you will miss him very much. So sorry to hear of the passing of your Father. He was a wonderful man who loved his children dearly. I will always remember the laughs we had out at Ponhook. My thoughts and prayers are with you all. Sorry to hear about Ed’s passing,our condolences to the family. Sorry to hear about your father’s passing we hold fond memories with him. We were so sorry to hear of Edwin’s sudden passing. You are in our thoughts at this difficult time. Take care of each other. So sorry to hear of your loss, My heartfelt sympathy to all of you at this difficult time . I would like to express my sincere condolences on Mr Ross’s passing.I met him at dialysis in liverpool and even though I didn’t know him very well i was struck by his friendliness and cheerfulness even under those conditions. He made everyone feel better just by being around him. May he finally rest in peace.